The Magic Chisel presents one of God of War’s most interesting environments to explore. The Magic Chisel is the seventh story mission in God of War. It’s not short, and it features an intense boss fight along with the standard diet of puzzles, riddles, and collectibles. Our walkthrough will help navigate through all events without discussing cinematics or the story. No spoilers here, folks. Leave Brok’s Shop and head down to one of the docked boats on the Lake of Nine. Use the objective marker at the top of the screen to determine course, then paddle towards it, passing under the two statues with paddles touching the shores near the water. A short distance ahead will be a gate on the left and a shore to the front. Take the boat to the shore, find and turn the wheel to raise the gate. My plan was to hop back in the boat and go through the gate, but an unnamed ogre spawned in and kicked up a fuss. Ogres should not cause too much trouble at this point. My favorite strategy is to dodge its running attack where it performs a ground smash by evading behind it. Three to four hits can then be delivered using R1 before the ogre recovers. The Light Runic Attack (L1 + R1) and Heavy Runic Attack (L1 + R2) can also be useful and put an end to this ogre’s shenanigans in a big hurry. This fight should be more fun than tough for someone like Kratos. With the ogre down, loot the ground for any goodies dropped, then hop back in the boat and go through the tunnel where the gate once was. Paddle through the water in the only direction possible, listening to Mimir’s stories, then dock the boat after reaching the Northern Dock. It won’t take long to find a fight once the boat is docked. A couple of werewolves, or wolves that look a lot like werewolves, will be waiting ahead. Their main attack is to slash out with their claws, but a timely parry will knock them off balance and allow Kratos to devastate them with attacks. Clear them out and grab the dropped loot. Also take note of the Hidden Chamber off to the left from the boat dock. 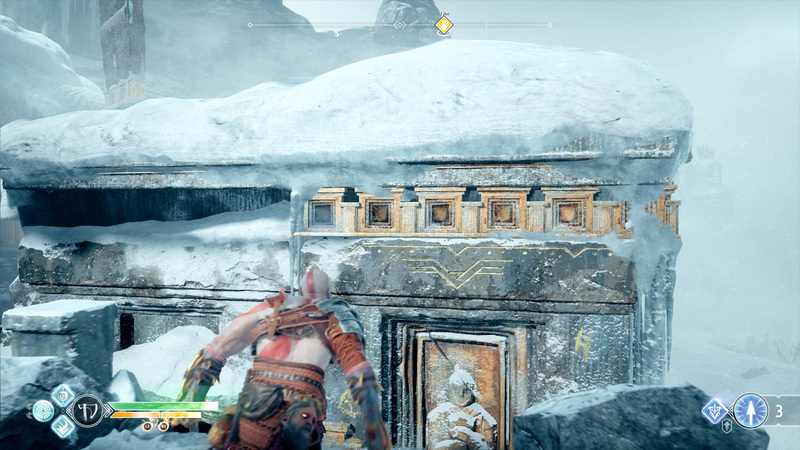 Kratos still can’t enter them at this point in the story, but we’ve covered how to unlock Hidden Chambers and all Hidden Chamber locations in separate guides. The ring on the giant’s finger has a Shatter Crystal in it. Have Atreus shoot it with a Shock Arrow to knock it loose. Kratos must then turn the ring to the right, having Atreus shoot it again, then to the left so that Atreus can shoot it one last time. This will knock the ice away from each side of the giant’s hand. The right side will have a casket that can be looted, and the left side opens the path forward. When Kratos reaches a chain, climb down to the ground floor, then move left and climb up the only spot on the wall. Ignore what looks like a Hidden Chamber; it is not useful right now. Move along the path to find another chain that can be climbed but walk past and loot the casket. Backtrack to the chain go up. Two more werewolves will need to be dispatched at the top of the chain. They are alone for now but know that there is an Ice Ancient sitting near a pile of debris in the middle of the area. Smack it with the Leviathan axe to wake it up. Remember that the only vulnerable part of an Ancient is its heart, so wait for it to open its chest, and then throw the Leviathan axe into it. This will cause pieces of its head to fall to the ground. Pick them up and throw them at the Ice Ancient for big damage and a possible stun. When the Ancient is stunned, climb on top of it with R3, then kick the nonsense out of it with R1 and R2. Just keep rolling that strategy until it falls, then pick up whatever goodies drop to the ground. With the area clear, look for the World Tree Sap that is near where the Ice Ancient was sleeping. It must be used to clear several obstacles. 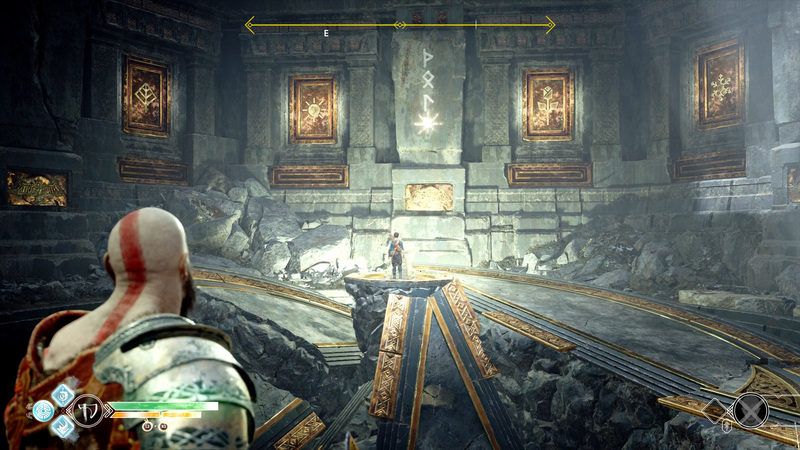 There is a gate in the area, and the three seals to open it are found to the right when Kratos climbs to the top of the chain, on the left of the area, and behind a World Tree Sap obstacle further up on the left. Throw World Tree Sap at the third seal, then have Atreus shoot it with a Shock Arrow. These seals must be set to match the seals on the front of the gate to open it. Once it’s open, crawl into the room and loot the chest. I found a legendary enchantment, so it was worth the trouble. Head back out into the main area where the Ice Ancient was. There is a casket in the middle of the area that needs to be looted, and bodies here and there with Hacksilver near them. Scour the ground, then look up and spot a Light Crystal. It can be knocked down using the World Tree Sap trick where Atreus shoots it with a Shock Arrow. Pick it up and carry it to the far end of the area, placing it in the only nearby slot. Have Atreus shoot the Light Crystal with a Light Arrow, activating a Realm Tear. Reach inside and pull out some Dust of the Realms. Continue toward the objective now that this area is done. 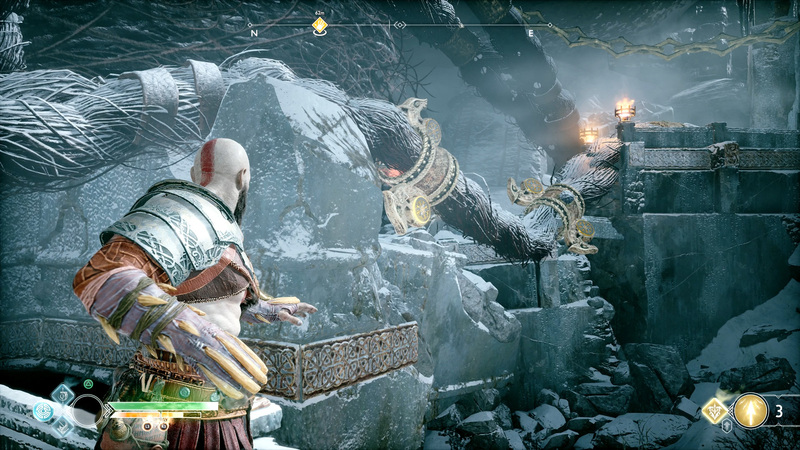 There will be a couple Nightmares to deal with, as well as a large pillar to lift from the path, and then Kratos will need to find a way to break through the thick ice. Expect enemies to spawn in at this time, but they are standard business at this point and can be dealt with using normal combat techniques. When they’re gone, however, a couple of ogres will spawn in. As per usual, evade their attacks and strike when they’re off balance or recovering stamina. If Spartan Rage is an option, this isn’t a terrible place to use it to eliminate one ogre quickly and calm things down. Should Kratos stun an ogre and mount it using R3, direct the ogre towards its buddy. The ogre Kratos is riding will smash the ground, damaging anything in its path. Loot the area thoroughly, then climb up the chain that Sindri drops down. Spend some time at his shop, buying, selling, crafting, and upgrading, then loot the area for any Hacksilver or Healthstones on the ground. Look for the giant’s beard and a piece of jewelry used to braid it. Actually, there will be three pieces of jewelry used to braid it, each with a Shatter Crystal attached. Atreus must hit each Shatter Crystal with a Shock Arrow. The first and third pieces of jewelry are easy, but the middle one is a pain. 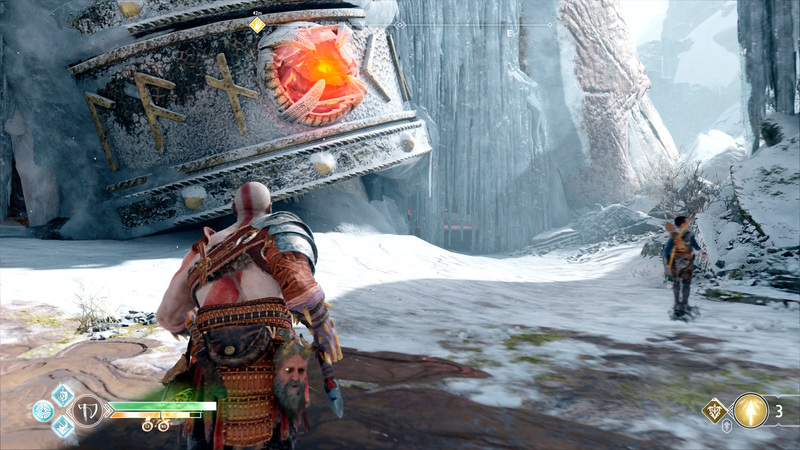 Kratos must throw his Leviathan axe to spin the jewelry, exposing the Shatter Crystal. Atreus must be quickly commanded to fire his Shock Arrow before the Shatter Crystal does a full rotation. 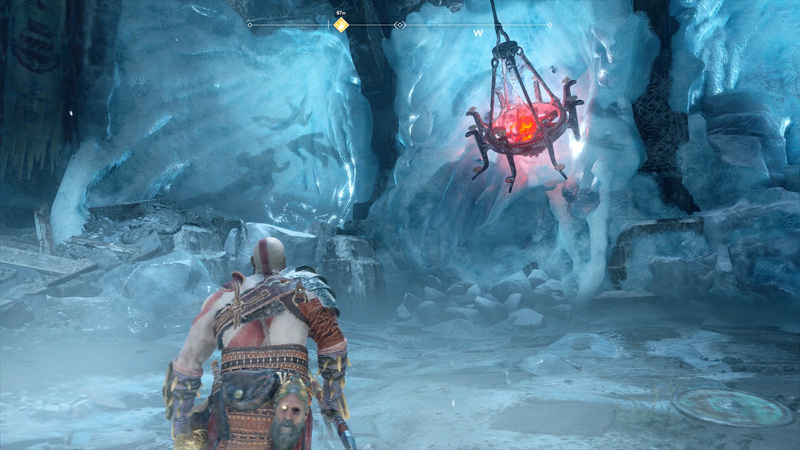 It might take a few tries, but once all three Shatter Crystals are hit, the piece of braided beard will fall and allow Kratos to jump to where it once sat. The path forward will be linear for a moment, with only a chest full of Hacksilver to note. Keep moving and jumping until reaching two doors. Open those and hop down to face off against a Traveler, one of the tougher non-bosses in the game. This dude has a shield on his back and will back up towards Kratos to prevent taking damage. As he gets close, he’ll use two or three wide-swinging attacks with his word, so evade or parry. Even blocking (without perfect timing) can cause Kratos to absorb a considerable amount of damage. The other attack this Traveler uses is a lunging attack where he tries to skewer Kratos. It hits much faster than it looks and covers a lot of distance, so be prepared. Play strong defense in this fight, then unleash everything Kratos has when the Traveler is just finishing an attack and facing Kratos. Find the large boulder with a handle on it and pull it back as far as it will go. This will create an opening in the wall to pass through. Follow the path and jump to the wall, working around in a counterclockwise direction. This will lead to a platform with a strap hanging down, and of course there’s a Shatter Crystal on it. Have Kratos push the belt and immediately instruct Atreus to shoot the Shatter Crystal. This must be done twice to break the chisel free. Move along the path and jump to the strap. Climb up and keep working along the only available path to climb, ducking into the belt when required, then continuing the climb on the other side. It’s an easy section of the mission, and at the top of the strap the objective will complete, but now Kratos must Release the Strap. This is done by approaching it and following the prompts on the screen. Grab the pouch full of Hacksilver by the dead body and then go through the huge double doors. Loot the casket just inside the doors on the left, then head into the next room. Look to the right to see some boards that Kratos can smash with his axe. Do this and Atreus will climb through the opening to reach the sand bowl on the other side of the room. Atreus will read off the puzzle clues, indicating that the order should be winter, spring, summer, autumn, but that’s incorrect. The order is reversed for this puzzle. Arrange the symbols (throw the Leviathan axe at each one to rotate it) from left to right as follows: autumn, summer, spring, and then winter. 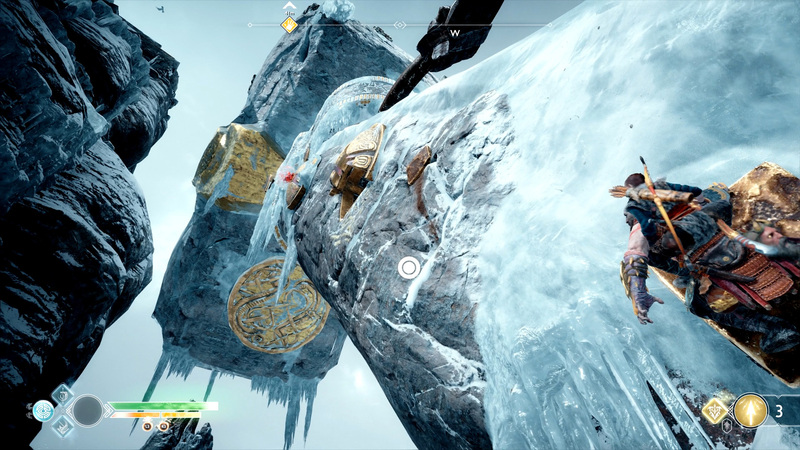 With the puzzle solved successfully, the floor will start to rise and lift Atreus and Kratos to the top of the hammer. This part is a pain as far as I’m concerned. As the floor rises, look for a status bar at the top of the screen to replace the compass. This bar indicates how much energy is left. When that bar is depleted, the floor gives out and Kratos and Atreus die. Because Atreus helps Kratos in combat, he cannot write while they’re being attacked. This means players must smash through the enemy waves quickly (before the bar is gone), allowing Atreus to get back to the sand bowl. In a nutshell, kill everything fast. After taking the final enemy (a Revenant) down, the floor will work its way up. Just before the top, however, things go badly and Kratos must jump to the nearby wall and climb the rest of the way. Climb along the wall and up to the hammer. Pushing it is a simple as following on-screen instructions, and then a cinematic will do the work for a short bit. When this ends, crouch walk through the tunnel until the objective updates. Jump to the nearby wall and climb along the linear path, jumping down to the ground once there are no other options. However, it’s straight back up onto another section of wall, and a short bit of climbing later Kratos will land on a path he can take. It’s pretty much a straight shot to some double doors, at which point Kratos and Atreus will find themselves in a dining hall. Look up to find a chandelier with a Shatter Crystal in it. Have Atreus shoot it three times, knocking it to the floor. 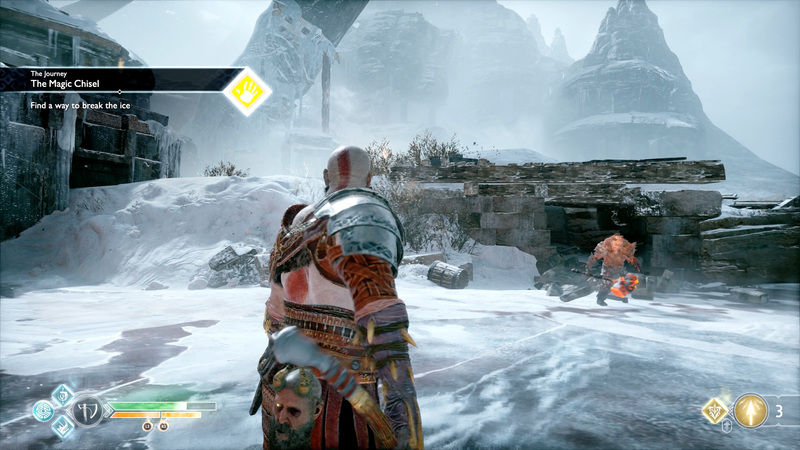 Kratos can now pick up chunks of Shatter Crystal and throw them at the weak points in the ice at the far end of the dining hall from where he entered. Atreus, of course, will shoot the Shatter Crystals to cause them to explode and bust through. There are three weak spots in total. When broken, the weak spot on the right will bring an ogre into the room. As per usual, dodge its attacks and counter when it’s either facing away or tired. The Light Runic Attack (L1 + R1) and the Heavy Runic Attack (L1 + R2) can both be used to put major damage on it in a hurry. 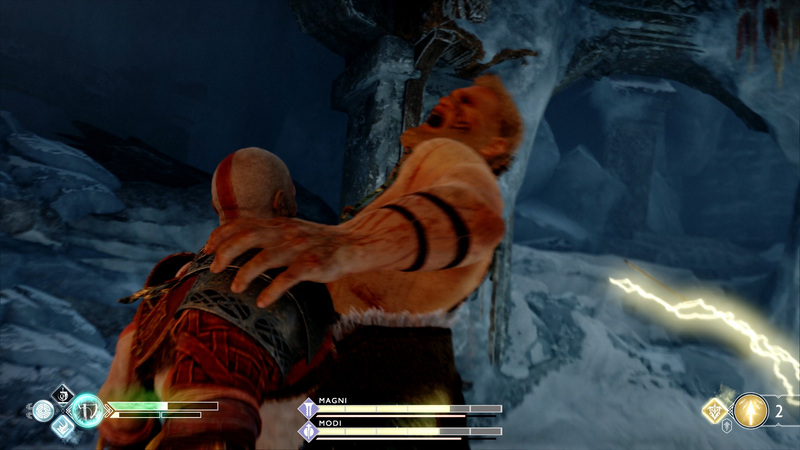 This is a normal ogre fight for the most part, with Kratos only having to worry about dodging the boulders thrown at him as an additional concern. The second (middle) piece of weak ice has a troll behind it called Stonebeard King. He’s carrying his giant pillar with him which he likes to swing like a battering ram, and smash on the ground if Kratos gets too close. Keep rolling away from its attacks and countering with Light Attacks (R1). Don’t forget that Atreus can help with arrows, although that does little more than distract the Stonebeard King. Still, Kratos has faced several of these by now, so it’s a standard encounter. The third point of weak ice (left) is the path forward. First, however, have Kratos kill the enemies that spawn in, and have him throw a Shatter Crystal at the casket on the second level. 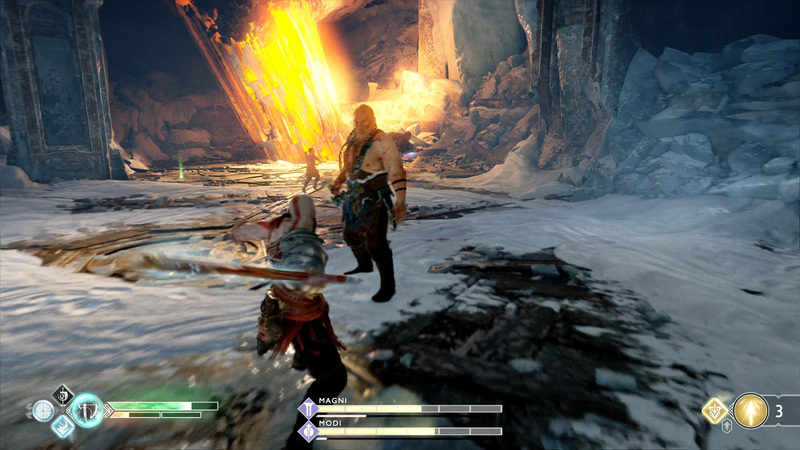 Make sure Atreus shoots the Shatter Crystal with a Shock Arrow to break away the World Tree Sap obstacle, then loot it after Kratos reaches the second level. Also take note that Sindri has another shop here. Do any upgrades needed now, because things will get serious in a moment. When ready, move forward on the path to Retrieve a Piece of the Chisel. 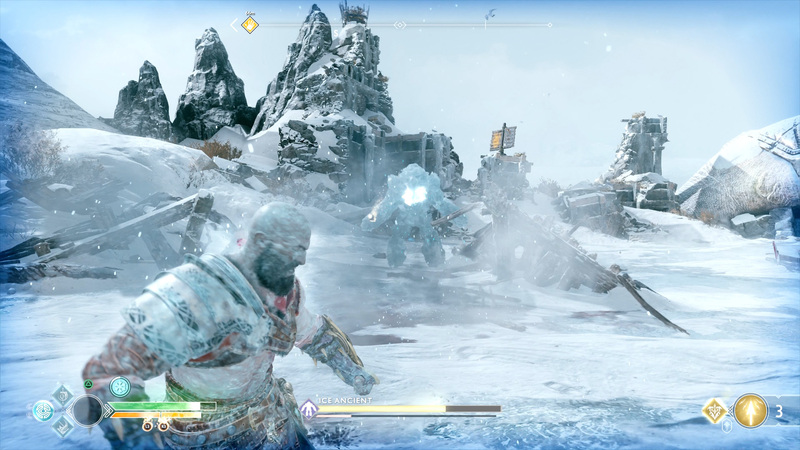 This boss fight is a little bit nuts, with Kratos and Atreus tasked with taking on both Magni and Modi at the same time. The good news is that Atreus tends to distract at least one, allowing Kratos to work over the other. It’s also worth noting that the fight does not end until both brothers have their health bars (displayed at the bottom of the screen) fully depleted. Magni is the one without the shield, but he carries a huge sword. Any time Kratos misses the timing on a block (L1), Magni is going to take a big chunk of his health. However, if Kratos can evade or parry the attack with a perfectly timed block, Magni can be damaged with several Light Attacks (R1). It’s also worth noting that he can be easily damaged by throwing the Leviathan axe at him, since he has no shield. This is useful if Kratos just needs a minute to settle things down. Modi has the shield, but his scepter is much less to worry about in terms of taking damage. He can block, though, so it’s not always as easy to hurt him. My strategy was to wait for Modi to attack, then parry the attack, knocking him off balance. Strike hard with damage at this point and his health will melt away. After enough damage has been dealt to both Magni and Modi (about one third), they will turn the lights out and block Kratos from seeing their position. However, Kratos can hear them speaking, which allows him to rotate (Right Stick) to face the threat. When one of the brothers’ attacks, press L1 to block it and send them flying. Be mindful that one of the brothers will speak, drawing Kratos’ attention, then the other one will attack from another direction. Keep watch for the attack indicator and respond accordingly. After several successful blocks in the dark, the fight will shift back to the light. It’s more of the same, with Atreus generally distracting one brother while Kratos deals with the other. A fun trick is to hit the brother Atreus has distracted from behind since they won’t be able to block. Just watch the other brother doesn’t return the favor. When each brother has about one third of their health reaming, it’s back to the darkness where several more attacks must be blocked. The final third of the fight (in the light) plays out roughly the same as the first parts. Work the health bars down for both Magni and Modi. When both bars are depleted, the fight shifts to a QTE (quick time event) that will see its conclusion. Just follow the on-screen prompts and that’s the end of it. When the fight is over, loot the ground (make sure to grab the Frozen Flame to upgrade the Leviathan axe), then hack off a piece of the chisel. That will do it for The Magic Chisel. 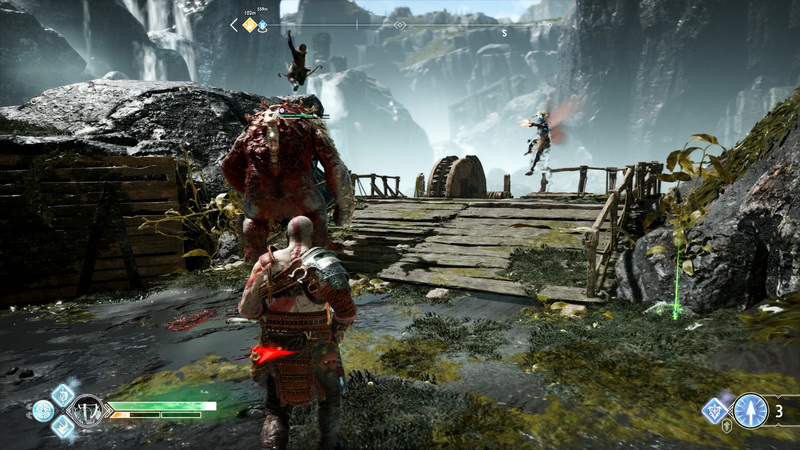 Kratos and Atreus are on to a mission called Behind the Lock. Of course, there’s a lot more to do besides follow the main quest line. Visit the Shacknews God of War walkthrough and guide to browse through all our content.